Here are re:3D, our motto is “Think Big, Print Huge”. With the aim of bringing FFF 3D printing off the table top into the factory, we manufacture big machines that can print human-sized tools. Isn’t it funny, then, that our teammate Mike Battaglia’s most popular file on Thingiverse is a small statuette of a squirrel? 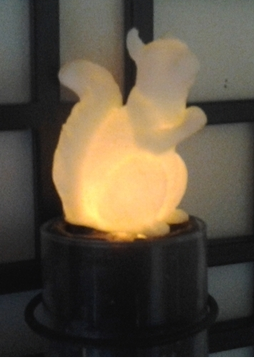 This squirrel statuette is actually a 3D scan of a real concrete statue Mike purchase from Marshalls in 2012. Mike figures he walked into the store that day to buy something completely inane, like some new towels or a bath mat. Little did he know he would discover so much more. Although it was simple, this concrete squirrel statue spoke to him. He knew he had to have it, and because it had a tiny chip on it’s tail, it he was even able to haggle down the price. The original squirrel was about one foot tall and lived on the back of Mike’s toilet in his apartment in Brooklyn. After a time, he began to dress it up, just to spice up the view from his urination station. One day, he decided he simply wanted more of them. Mike got a real great scan of the statue from Autodesk’s 123 Catch, sliced the file and fed it into his 3D printer. A few hours later, he had significantly increased his squirrel statue capital. The Squirrel Guardian struck a chord with Thingiverse users, and one by one the downloads stacked up. At the time of publication, this file has been downloaded 3610 times, and 40 of those users have printed the model and uploaded a photo of it to the site. Users from Russia to California to Austria have printed Squirrels in a variety of colors and sizes. There is a Squirrel Guardian so small it can sit on a penny, a Squirrel Guardian made into a night light, a Squirrel Guardian painted up in people clothes. One user scanned his own head onto the Squirrel’s body. This same user also made it a cannibal squirrel, where one squirrel is eating another squirrel. 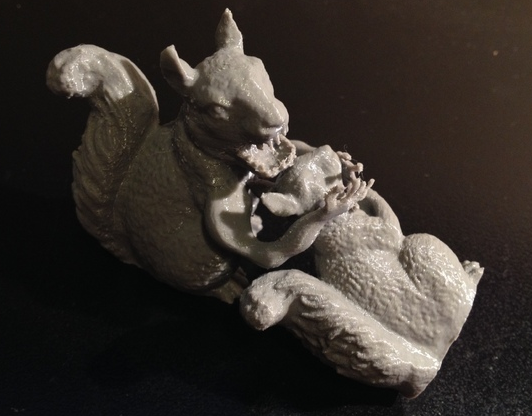 In my mind, the most incredible use of the Squirrel Guardian is by the Thingiverse user Squirrel_Whisperer, also known as Tom Schuck outside of the internet. Tom is recovering from a stroke, which left him with a brain injury. Before his injury, Tom was a 6-figure IT executive, but unfortunately his injury has left him unable to work any more. Instead of letting his brain injury and limited mobility dampen his attitude, Tom became determined to reinvent himself. Tom decided his “new” self would be an author and an artist. His inspiration: squirrels. Tom’s said his fascination with these furry friends came about when he decided to try bird photography. Instead, he found that squirrels were much cuter and much more fun to photograph than the flitty and flighty birds in his yard. From there, his appreciation for squirrels began to blossom. Around the same time as Tom discovered his love of squirrel photography, his son bought a desktop 3D printer and introduced Tom to Thingiverse. There, Tom found Mike’s Squirrel Guardian file and began to print them. Being able to hold Squirrel Guardians in his hands allowed Tom to imagine his favorite animal in fantasy roles, and he has since written two fantasy novels with squirrels as the main characters. The photos he has uploaded to Thingiverse are Squirrel Guardians he has painted to represent the characters in these fantasy novels. 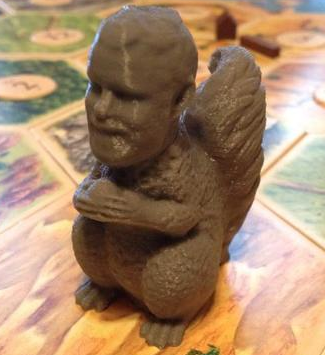 Because of users like Tom, the Squirrel Guardian has become so much more than a figurine you could place on the back of your toilet. Squirrels are now a crucial part of Tom’s new identity. 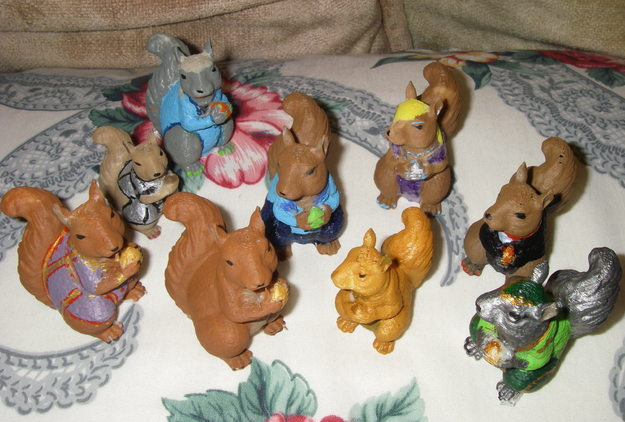 Now, people will approach Tom and say, “I saw a squirrel and thought of you.” Now, because of his son’s 3D printer and Mike’s Squirrel Guardian, Tom can have as many little squirrel figures as he desires. This is a good thing for a man who has taken to the noble pursuit of self-reinvention following a traumatic life event. At re:3D, we try to print big, but I think what is most important to everyone on our team is that we print with a purpose. Sometimes, in the case of Mike’s Squirrel Guardian, the purpose of a print is unintended. He never could have imagined when he bought the original Squirrel Guardian from Marshalls that a man would use this same model to help him heal after a traumatic injury. Mike’s Squirrel Guardian is not the most popular file in the history of Thingiverse, by any means. 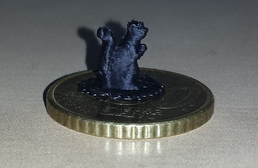 However, the Squirrel Guardian makes a compelling case for the usefulness of 3D printers, even ones at the desktop size. Too often I hear 3D printing skeptics and evangelists alike bemoan the fact that 3D printers are used only for the making of “trinkets”. I believe that Tom’s story shows us that sometimes, these seemingly useless models can become extremely meaningful pieces in an individual’s life. Just because a model isn’t a tool or a part of a machine, it doesn’t mean it isn’t making someone’s life better. When re:3D’s Austin team moved into our new office, one of the first things we did was set up a Gigabot and kick off a print. 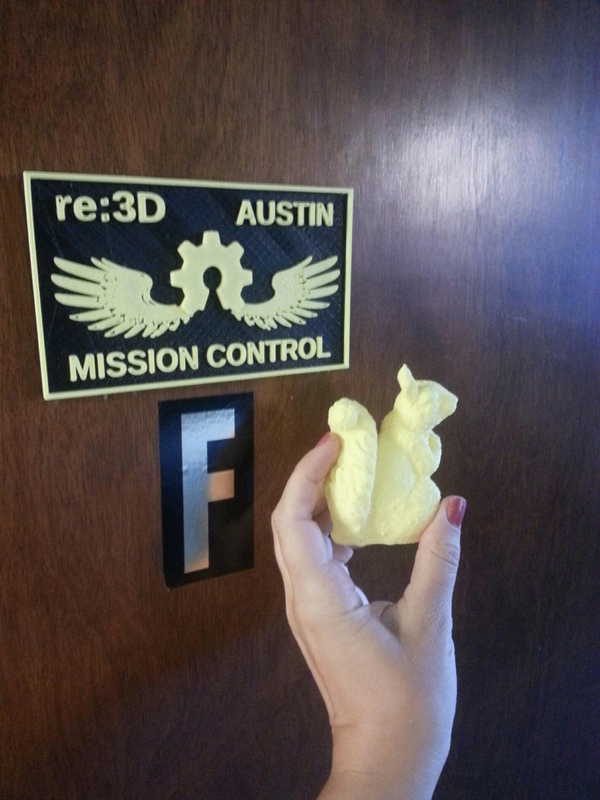 We knew, without a doubt, the first thing we would be printing would be a Squirrel Guardian.